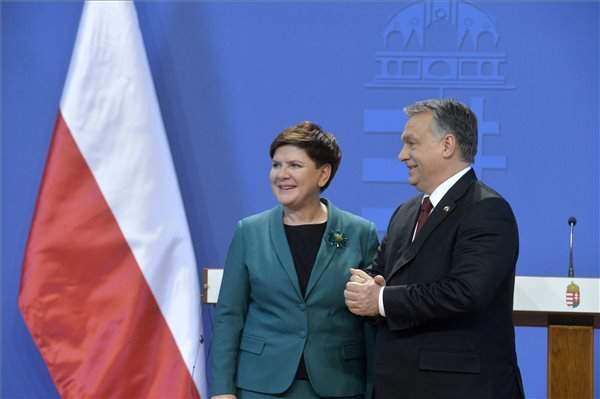 Budapest, February 8 (MTI) – Poland can count on Hungary’s solidarity regarding any use of “double standards” against it, Prime Minister Viktor Orbán said after talks with Polish Prime Minister Beata Szydlo in Budapest on Monday. 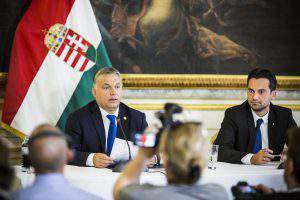 Speaking at a joint press conference, Orbán said that he and his Polish counterpart agreed on the need to further strengthen the Visegrad Four grouping of Hungary, Poland, the Czech Republic and Slovakia. 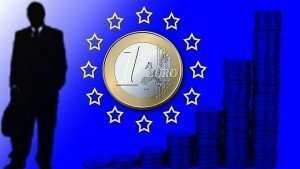 He said that in the coming years, the success of the European Union would depend on the success of central Europe. Orbán praised the “historic” friendship between Poland and Hungary, which he said was “tried and tested”. Concerning bilateral economic ties, Orbán said he agreed with Szydlo on connecting the two countries’ eastern industrial regions with a four-lane highway in order to strengthen ties between Hungarian and Polish companies. The two leaders also agreed on strengthening direct rail services and flights. Concerning Britain’s EU renegotiation, Orbán said Hungary and Poland accept most of Britain’s proposals for EU reform, adding, however, that more talks are needed on certain points. The V4 remain committed to representing a joint position on the matter at the next EU summit in Brussels to be held later this month, he said. On the topic of Europe’s migrant crisis, Orbán said Europe’s southern external borders remain unprotected and Greece is incapable of protecting the continent, which is why the Hungarian government believes that a new line of defence is needed along the Greek-Macedonian and Greek-Bulgarian borders. He said although western European countries are now tightening security on their borders to stem the inflow of migrants, “migration did not force its way into western Europe, but rather the doors were opened.” Orban said there were even times when western European countries were transporting migrants inward. Orbán said most western European leaders still see migration as a positive, just as they did half a year ago. He said that until European leaders realise that migration is bad for Europe, the inflow of illegal entrants cannot be stopped. He called on western European leaders to support the central European stance of a need for a southern European line of defence against the migrant flow. Orbán said western Europe does not appreciate central European efforts to help people fleeing the Ukraine conflict, adding that Poland especially deserves to be recognised for its efforts, as it has aided people from Ukraine without the use of EU funds. Responding to a question, Orbán said the EU should organise a debate on what kind of union member states want, adding that the V4 plans on initiating such a debate within the next few years. Szydlo said Poland will always support Hungary in political and economic matters and is “thankful” for Hungary’s solidarity. She said Poland and Hungary are committed to forming a joint position on Britain’s EU renegotiation. The prime minister said the most important part of Britain’s proposals is the plan to restrict EU migrants’ access to social benefits, which she said was “unacceptable”. The prime minister said the two countries are also committed to strong cooperation on Europe’s migrant crisis. Szydlo reiterated Poland’s stance that the Schengen Area’s southern borders should be strengthened and that the solution for the crisis itself lies outside the European Union. She said Poland is serious about protecting its eastern border. Szydlo said Poland and Hungary are continually strengthening political and economic relations, as both countries feel it is important for the central European region to take on an increasingly large role on an international level. Speaking at a joint press conference, Szydlo said Poland and Hungary are committed to forming a joint position on Britain’s EU renegotiation. The prime minister said the two countries are also committed to strong cooperation on Europe’s migrant crisis. Szydlo reiterated Poland’s stance that the Schengen Area’s southern borders should be strengthened and that the solution for the crisis itself lies outside the European Union. Isn’t it strange how Western Europe can pull countries down, like the V4, yet the V4 can form solidarity in order to save the exstance of all Europe. I think there is a lesson to be learnt here. All known factors of a disagreance within the Western European countries should be ashamed of themselves, namely Merkel, Faymann and all the other Liberal counterparts. Why don’t you wake up Western Europe and tale not from the only European brains, V4. Well done the V4, and keep up the good work.